Scientists have discovered that a polymer can provide a key to get into tumors: Prof. Prasad Shastri, Director of the Institute of Macromolecular Chemistry and core member of the cluster of excellence BIOSS Centre for Biological Signalling Studies at the University of Freiburg, and graduate students Julia Voigt and Jon Christensen have developed a new paradigm to home nanoparticles, containers that measure a few 100 nanometers in size, to endothelial cells. 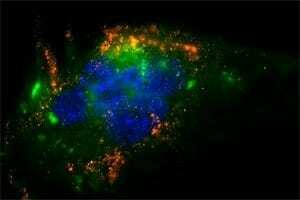 Using just charged polymers with the right affinity for cell lipids the team has developed nanoparticles that can recognize specific cell types simply by their chemical properties. “This is a remarkable discovery, as it allows for the first time to target a specific cell type purely through biophysical principles, and without using the traditional ligand-receptor approach” says Prof. Shastri who led the study that was selected as cover article of the Proceedings of the National Academy of Sciences. Until now researchers placed molecules on nanoparticles that can latch onto proteins on cell surface – called receptors. These receptors act as an address or a biological postal code. However in tumors these addresses can change rapidly with time. To solve this lack of precision Shastri and team developed particles that are delivered to endothelial cells using a biophysical approach. “This delivery approach does not require a biological postal code for targeting of nanoparticles and is an important step forward in developing nanoparticle based systems for treating cancers” says Julia Voigt the lead author of the paper. Cancers are very hungry tissues and they need constant nourishment. This is provided through their own supply of blood vessels. “By going after endothelial cells that make up these blood vessels, we can starve the tumor or kill it with one payload” says Jon Christensen who is a co-author on this study and works on tumor metastasis. Nanoparticles are used to deliver therapeutics in treating cancers. These very small pills, cornerstones of nanomedicine, get injected into the body and reach the tumor cells via the bloodstream. When they find the targeted cells, they need to be eaten so that the drug can act within the cell. April 16, 2019 - UBC attracts over $40M to host Networks of Centres of Excellence in nanomedicines UBC Faculty of MedicineLed by Pieter Cullis, the NanoMedicines Innovation Network aims to develop nanomedicines that will deliver drugs more specifically to the sites of disease. April 18, 2019 - Applications of Molecular Engineering in T-cell-based Immunotherapies Advanced Science NewsCell-based therapies to control and modulate the body's immune response are a clinically proven life-saving treatment for patients with certain types of cancer.